I had a craving to eat a nice hunk of rotisserie lamb after looking at my vacation pictures from Greece. What does a good foodie do when he has a hankering for something? Go make it! 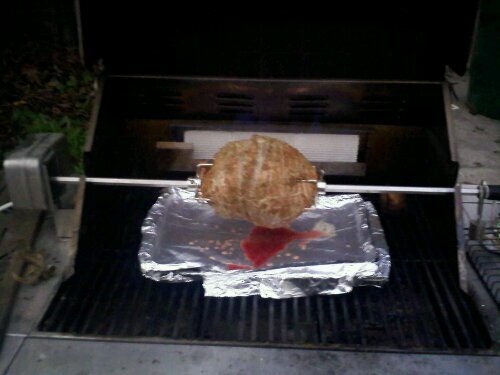 This blog post about making a boneless leg of lamb on your gas grill’s rotisserie. I know the rotisserie may be a sore point for some people out there. After all you probably paid extra for your gas grill, because you insisted on having this functionality. Most likely you were having fantasies of rotisserie chickens dancing in your head. But in reality, how many times have you used it? once or twice? Maybe not at all? Don’t worry you are not alone. This recipe is relatively easy and a great excuse to start using that rotisserie again, or for the first time. Step 1 – Take the lamb out and let it rest at room temperature. The goal is to get the lamb’s internal temperature as close a possible to the exterior temperature, about 60 minutes. Step 2 – Make a liquid mixture of the oil, dressing, lemon juice and red wine and either soak it for 30 minutes for give it a brush down with the liquid mixture. 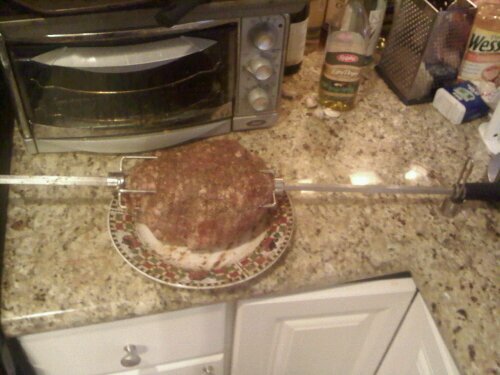 I personally prefer to work a drier cut of meat, so I simply brush it on. Next, insert the rotisserie rod through the meat and secure with the rotisserie hooks. Step 3 – Place a cookie sheet wrapped in foil under the burner. Next, connect the rotisserie skewer to the rotation motor and turn the motor on slow. Set the rotisserie burner to high for the first 20 minutes, this technique will sear the meat and ensure the moisture is locked into the meat. The heat should stay at medium. Be sure to also baste the rotisserie every 15 minutes with the drippings and a the liquid marinate. Be sure to close the hood when you are not basting! Step 4 During the last 30 minutes, place cut up brown onions with yogurt butter in aluminum foil pouch next to the heat source. The onions will brown from the heat while the lamb cooks. 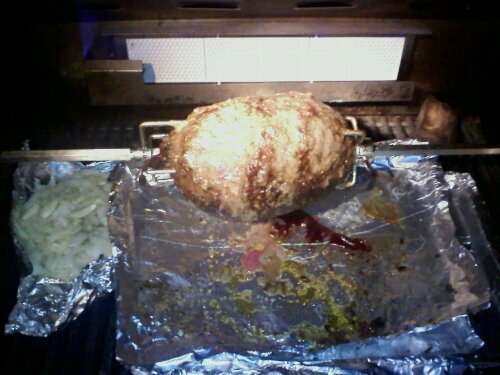 The lamb should cook on the rotisserie for 20 minutes per pound. When it is done it should have a dark brown exterior and internal temperature of 150 (Somewhere between medium-rare and medium).During the last 10 minutes (assuming the meat is not too dark), crank the burner to high; as a result, the exterior will turn slightly crispy and crusty. 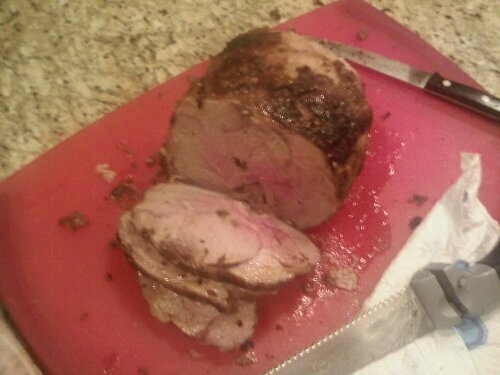 Note: Please use a thermoter to cook your lamb, every gas grill is different so the 20 min per pound is NOT full proof. Check the temperature often, as it may reach 150 without warning. You MUST avoid cooking lamb to “well done” as it will be very tough and dry. Step 6 – Remove the meat from the flame , extract the skewer (use caution the skewer is hot) and wrap the lamb up in heavy foil. Let the lamb rest in the foil for 10 minutes, allowing the temperature to settle and the juices withdraw back into the muscle of the meat. 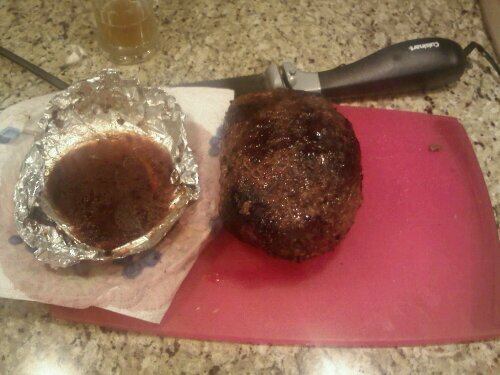 After 10 minutes, remove the foil carefully as the button section will have a puddle of meat juices you will retain for au juice or sauce. Note: The meat will continue to cook in the foil, so if you wish your meat to be a little more rare, then I suggest taking it out at 145 degrees. 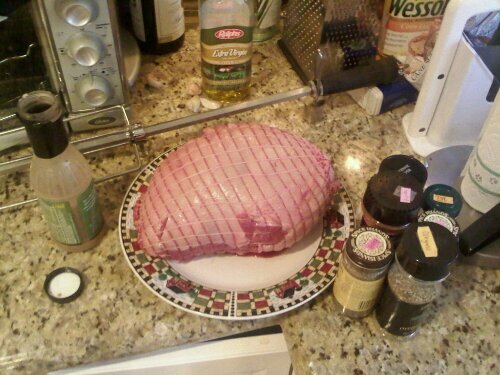 Step 7 – Place the meat on the cutting board and cut it against the muscle grain into half inch slices, be sure to retain the juices from the cut. 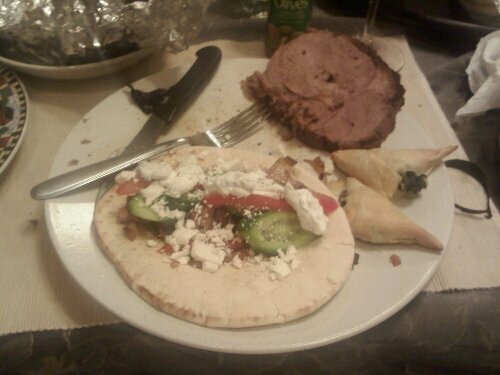 Step 8 – Finally, assemble a toasted pita with taziki, feta, tomato, Persian cucumbers and thick cuts of lamb and drizzle with the collected juices. Next wrap it over and shove it in your mouth. Yummy! (600 calories as shown). I recommend a California Central Coast California Zinfandel with this dish as it handles the gamy lamb and pugent garlic well. I tried this wine with the meal and it was excellent.